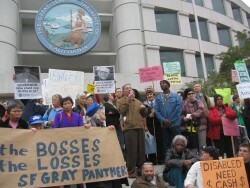 Building on their rally last month to protest the Governor gutting the renters tax rebate, a San Francisco coalition of senior, disabled and tenant activists held a larger protest yesterday – as part of its Statewide Day of Action. But they were not alone. San Diego, a city not known for its political activism, also had a protest that attracted three television stations and the major city newspaper – coordinated by a disability rights advocate who had never before run a press conference. In rural Fresno County, a group of seniors who heard about the coordinated protests staged an impromptu rally in the town of Selma. And at the Los Angeles event, activists secured the support of Assembly Speaker Karen Bass – who will play a central role in upcoming budget negotiations with Arnold Schwarzenegger. While many state legislators are sympathetic that low-income tenants have lost a $347.50-a-year rebate in tough economic times, progress in Sacramento will depend on the leadership playing an active role. With Bass’ support, saving the renters rebate got a major boost. The Senior Citizens Property Tax Assistance program has been in effect for decades. Under the program, renters who earn less than $44,000 and are senior, blind or disabled receive a once-a-year payment of up to $347.50. Renters have to apply for the rebate each year, and last year 467,000 California households received it. In late September, after the legislature passed a state budget with devastating cuts for poor people, Arnold Schwarzenegger added insult to injury – by killing it with his line-item veto power. Applicants received letters in October, informing them the program had terminated. “When the state robs from the poor,” said San Francisco Supervisor Aaron Peskin, “the impact on our City is terrible. It means more people have to be treated at SF General Hospital. It means more people go to the SF Food Bank. It puts a drain on our local treasury.” This week, Mayor Gavin Newsom has proposed devastating mid-year cuts to deal with the City’s budget deficit – mostly on social programs that help the poor. It’s not like seniors and disabled tenants haven’t already suffered from this year’s budget. To accommodate Republicans in the legislature who adamantly refuse to support any tax increase whatsoever (and can hold the entire budget hostage because of the two-thirds vote requirement), the Democratic majority agreed to deny cost-of-living adjustments for SSI and SSDI recipients. “That means people won’t be getting $200-a-year from their checks,” explained Brian Basinger of the AIDS Housing Alliance of San Francisco. Of course, support from the “leadership” in Sacramento during tough budget times won’t be enough to restore the renters’ tax credit. Which is why a statewide effort that includes more than the usual suspects will be crucial. In San Diego, Connie Soucy – a disability rights advocate of Access to Independence – organized her first press conference, and 3 television stations and the San Diego Union-Tribune covered the event. She had help from Disability Rights California and the Affordable Housing Coalition, bringing a powerful message to a city that isn’t known for its political activism. Finally, a “Statewide Day of Action” to restore the Renters Rebate even prompted some activists to start their own events. In Selma, California – a town in Fresno County – a group of senior activists who heard about the protests going on in major cities decided to take it upon themselves. At 2:00 p.m., they held an impromptu rally – proving that this issue can bring Californians together to demand that Arnold do the right thing.